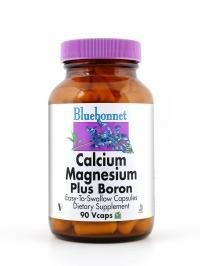 Bluebonnet’s Calcium Magnesium Plus Boron Capsules are specially formulated with a high potency combination of chelated calcium, magnesium and the trace mineral boron. Formulated with a full range amino acid chelates from whole rice protein. Available in easy-to-swallow vegetable capsules for maximum assimilation and absorption.